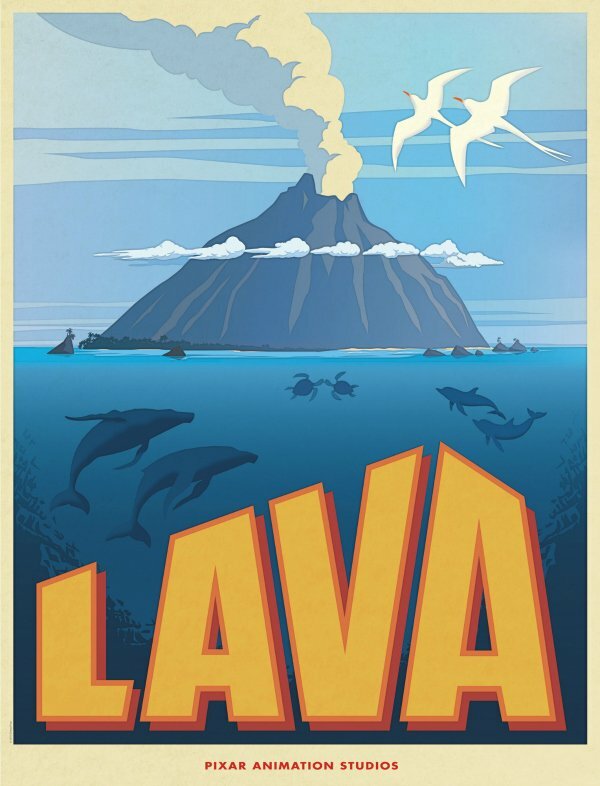 In addition to teasing a small band of journalists Thursday with footage from the upcoming Inside Out, Pixar Animation Studios revealed that the short film programmed to play in front of Pete Docter’s feature next year will be titled Lava… and they shared that gorgeous poster above to help set the stage. James Ford Murphy, the head of animation of Pixar, helms this short after logging time as an animator on A Bug’s Life, Toy Story 2, Monsters, Inc., Ratatouille and many more Pixar features. Murphy has been toiling in the Cars universe for Pixar as of late, serving as supervising animator on the spinoff short Mater and the Ghostlight. He also supervised the animation on this brilliant short, still one of Pixar’s best. What’s Lava about? According to a studio release, the movie will be "a musical love story that takes place over millions of years" and was "inspired by the isolated beauty of tropical islands and the explosive allure of ocean volcanoes." Sounds beautiful. And also sounds like a great excuse for Pixar’s animators to enjoy several field trips to gorgeous tropical islands so they can explore how best to animate the Lava in bubbling, menacing volcanoes. We’re on to you, Pixar! We know that’s why you set Ratatouille in the world of French cuisine! I’m happy to hear that Pixar’s staying in the Original Shorts game, as recent plans also have included stories rooted in the Toy Story universe. Small Fry and Partysaurus Rex were attached to The Muppets and Finding Nemo 3D, but the last few Pixar features showcased brilliant and beautiful short animations like La Luna (with Brave) and The Blue Umbrella (with last summer’s Monster’s University). As for Inside Out, Eric attended the panel Pixar held on Thursday and left raving about the footage that was screened. Read his complete recap here, and prepare for both Inside Out and Lava to screen in theaters on June 19, 2015.